In light of the outrage caused by the campus hires from BITS and other institutes that were left high and dry after Grofers rescinded their offer letters, the Grofers founders have extended a public apology. 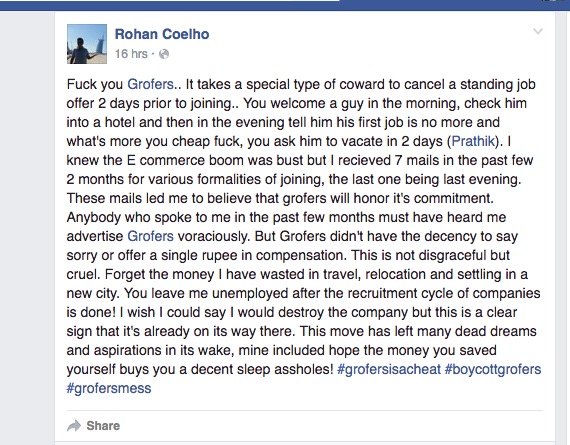 The matter came to public scrutiny when Rohan Coehlo, a student from BITS Goa was hired off campus for an operations position at Grofers last year. For 7 months, he received communication from the company over joining formalities, finally moving cities to join the job. 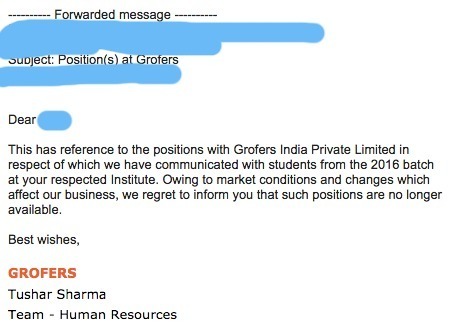 However, 2 days before his joining date, and after he’d been checked into the hotel, Grofers told him the job requirement had changed and he was no longer required to join. It’s not just the shocking act of revoking an offer letter 2 days before the joining date, but the manner in which the email was crafted that called for a massive outrage amongst the community. The letter simply said that the positions are “no longer available”. It offered no further explanation, a backup plan for the affected student or even a simple apology. Naturally, the student was livid, and posted the following on his Facebook. However, after the news of the same has done the rounds, Grofers seems to have realised its appalling mistake, and the founders Saurabh Kumar and Albinder have extended a public apology. In the past couple of months, we have been making some necessary strategic changes within the company. The changes we have made will, in our opinion, benefit our customers in the long term. However, these changes have made the new roles redundant and therefore, we are no longer able to continue with the offers we made a few months back. The blog however does not elaborate any details over the outplacement efforts for the affected students, severance package or the reason for its last minute decisions. Irrespective of the apology, the affected students can barely be pacified with the explanation. Having been offered a job offer almost a year ago, and being left in the lurch at the last minute isn’t something an apology can fix. At this rate, students are going to be wary of applying to startups for a job.